A signed cabinet card portrait of Captain (later Colonel) Henry May (1863-1930), who for many years served with, and later commanded, the Artists’ Rifles, one of the many volunteer forces established in the late 1850s and early 1860s as a response to the perceived threat of a French invasion. Born on 23 August 1863 at Quebec in Canada, Henry Allan Roughton May was the younger son of stockbroker Henry May, later of 30 Mecklenburg Square, London. A solicitor by profession, he was one of the founders of the firm Minet, May & Co of Dowgate Hill, EC4. In 1882 he joined the Artists’ Rifles. He commanded the regiment from 1912 to 1915 and again from 1919 to 1920. He served in the First World War and was mentioned in despatches before being invalided home. On 15 August 1889, at St Edmund’s Church in the village of Caister on the coast of Norfolk, he married Fanny Rose Allen, youngest daughter of Thomas Allen of Markshall near Norwich. The couple appear on the 1891, 1901 and 1911 censuses living with one servant at 1 Victoria Villas, Eastern Road, East Finchley in Hornsey. Their marriage did not produce any children. Colonel May died, aged 66, on 10 April 1930 at 18 Eastern Road, Fortis Green, Middlesex. He left an estate valued at £27,246. Photographed by Herbert Rose Barraud of 263 Oxford Street, London. 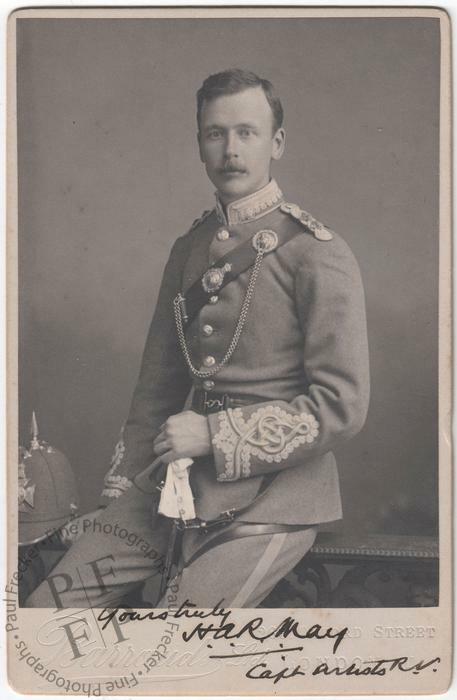 From an album presented to Thomas Dolling Bolton by Colonel Edis and the officers of the 20th Middlesex Artists’ Rifle Volunteers ‘in gratitude for his hospitality at Easter 1895.’ Thomas Bolton was for many years the Member of Parliament (Liberal) for North East Derbyshire. Condition: the print presents a few small, faint imperfections in the area of the background but is otherwise in excellent condition, as is the mount.